Does NK turn to 'pendulum diplomacy' between China and Russia? 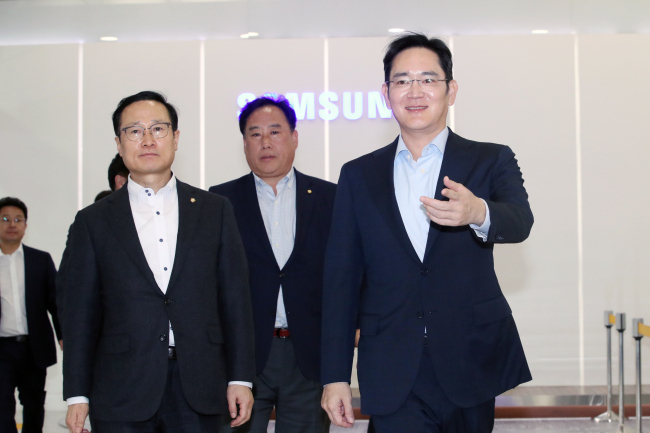 Vice Chairman Lee Jae-yong, de facto chief of chip giant Samsung Electronics, spent the Lunar New Year holidays in China as part of efforts to seek new strategies in the company’s memory chip business for this year, according to the company on Wednesday. Lee left Seoul for Xian, the capital of Shaanxi province in central China on Monday, a day before China’s New Year Spring Festival began, to check on Samsung’s memory plants in the city. Samsung has been operating a NAND flash plant in Xian since 2014 and is currently building a second with a $7 billion investment, from last year. “The vice chairman was planning to take a tour of the memory production site in China and hold a meeting with some Chinese government officials,” said a senior Samsung spokesman. Last year, South Korean chipmakers Samsung and SK hynix engaged in a kind of tug-of-war with the Chinese government on allegedly rigged prices of memory chips in the market, which prompted investigations into regional offices of the companies. Lee was also planning to take a look at Samsung SDI’s plant for electric vehicle batteries in Xian, where the company is rumored to construct another EV battery factory by investing over 1 trillion won ($893 million) this year. But he didn‘t appear at the SDI plant, the company confirmed. The Samsung heir’s visit to Xian has grabbed attention as it was made after a chat with President Moon Jae-in last month on Samsung’s chips strategy. The concerns about the chip market stem from recent falls in memory prices. In January alone, the price of 8-gigabit DDR4 DRAM slid 17.24 percent from the previous month, marking the sharpest fall since June 2016, according to market watcher DRAMeXchange.